Amazon announces Echo Dot and Tap voice-controlled devices | What Hi-Fi? The Echo Dot can connect to a number of devices around the home to give the added benefit of voice controlled use while the Amazon Tap is a portable Bluetooth and wi-fi speaker. 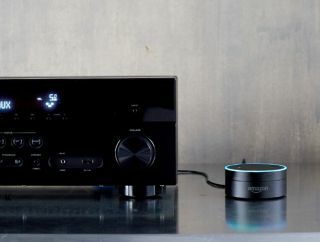 Both devices come with Amazon's voice-controlled assistant Alexa installed and the company says the Echo Dot can be connected to speakers via an auxiliary cable or Bluetooth to add voice-control to your home stereo system. It's a similar idea to Google's Chromecast Audio - Chromecast Audio, however, doesn’t have voice control capabilities. Echo Dot will allow the playing of music from a number of music streaming services including Amazon’s own Prime Music, Spotify, Pandora, iHeart Radio and TuneIn and you can ask Alexa to play certain tracks, artists and genres from any of these services. The Echo Dot can also be used as a smart alarm clock or in any room where there’s a smart home device such as Philips Hue lighting or WeMo devices. If you want to get your hands on one, however, there are a few criteria you need to meet. First, you need to be an Amazon Prime subscriber in the US; and second, you need already to own an Echo speaker or a Fire TV. Owners of these Amazon devices can order an Echo Dot by saying “Alexa, order an Echo Dot”, and add one to their basket for $90. The Amazon Tap meanwhile is an Alexa-enabled Bluetooth and wi-fi speaker that is said to offer “rich, full-range sound” from its dual stereo speakers with Dolby processing. Users can tap the mic button and ask the speaker to play music, get the latest news headlines, search for information or even order a pizza. The Amazon Tap is a little easier to get hold of as it’s available to pre-order now from Amazon’s US site for $130. There's no word yet on if and when the two devices will make their way to the UK - but when one considers that the Amazon Echo still isn't available to buy on the UK Amazon site and it was launched in 2014, it could be some time.